vibrant pedestrian experience on Cathedral Hill. 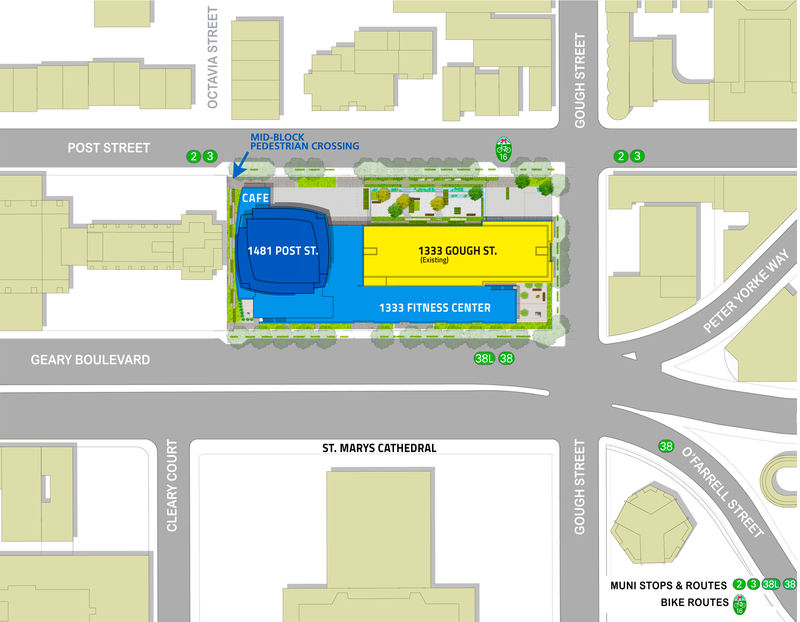 1481 Post Street is a proposed residential development located in the Cathedral Hill neighborhood, replacing an existing above-ground parking structure. The project promises to enliven and reinvigorate the surrounding neighborhood through its commitment to smart-growth principles and incorporating San Francisco’s urban planning goals, which call for a greater level of high density and transit-oriented housing. The enhanced design of 1481 Post Street, as well as the exciting improvements to the existing residential apartments at 1333 Gough, reflects years of neighborhood feedback and the SF Planning Department's input. ADCO is committed to developing a project that will serve as a resource both to its residents and the neighborhood. 1481 Post Street will provide needed housing for local employees, families and first-time home buyers who choose to live in this central location with convenient access to all areas of the City via rich public transportation options. between Octavia and Gough Streets. replacing an existing above-ground parking structure. ranging in size from one bedroom up to four bedrooms. ranging in size from studios up to two-plus bedroom units. The existing 1333 Gough above-ground parking structure will be replaced with a new four-level subsurface parking garage; providing parking for both 1333 Gough and 1481 Post residents. 1481 Post residents will have one parking space per residential unit. This amount of off-street parking ensures that the nearby on street parking will not be overburdened by new residents, but is also consistent with the City's Transit First policy, which seeks to limit the size of parking garages in the City. These subsurface features have been incorporated into the design in order to create the opportunity for open-space and a pedestrian friendly streetscape. The City's Draft Environmental Impact Report was published on July 30, 2014. The DEIR comprehensively analyzed all environmental impacts on the neighborhood. 1481 Post Street will be LEED Gold certified by the US Green Building Council, incorporating the latest technology to enhance water and energy conservation, public transportation access and include on-site care sharing and bike-parking programs. Details on these programs, plus various environmentally friendly architectural and design features are included in the City's Draft Environmental Impact Report. Clicking the link above will direct you away from this site and to the SF Planning Department's Official website. Please be patient while the SFPD website loads. In 2005, ADCO began exploring the possibility of building new housing on part of the 1333 Gough Street site. The entitlement process for 1481 Post Street began soon after in 2006. What is presented here is the current design of 1481 Post Street which reflects years of feedback.